First of all I would like to thank the Swiss government, the Global Commission on Drug Policy and the Graduate Institute for organizing this event and inviting me to say a few words to you. Our Chair, my friend Ruth, has briefly introduced the Global Commission on Drug Policy, of which I am proud to be a member. When we talk about drug policy today and lament that earlier this year the international community could have done much more and did not make as much progress as many of us here in this room had hoped, one easily forgets that just 5 years ago we could not have dreamt of being where we are now. In 2011, when the Global Commission published its first report, it was effectively “breaking a taboo”. And this is especially remarkable as the members are not in the age group that usually engages in breaking taboos. It was the first time that a group of global leaders stopped talking about drugs in moral terms of good and evil and instead put forward evidence-based analysis and recommendation. And this was noticed not only in Vienna, but in Washington, in Moscow. Together with other actors, the Global Commission has positively transformed the international conversation away from prohibition to an approach emphasizing safety, rights, health and development. It is today widely recognized as a key reference on drug policy reform. Just a few years ago it would have been unthinkable that a sitting Head of State would make such a statement. 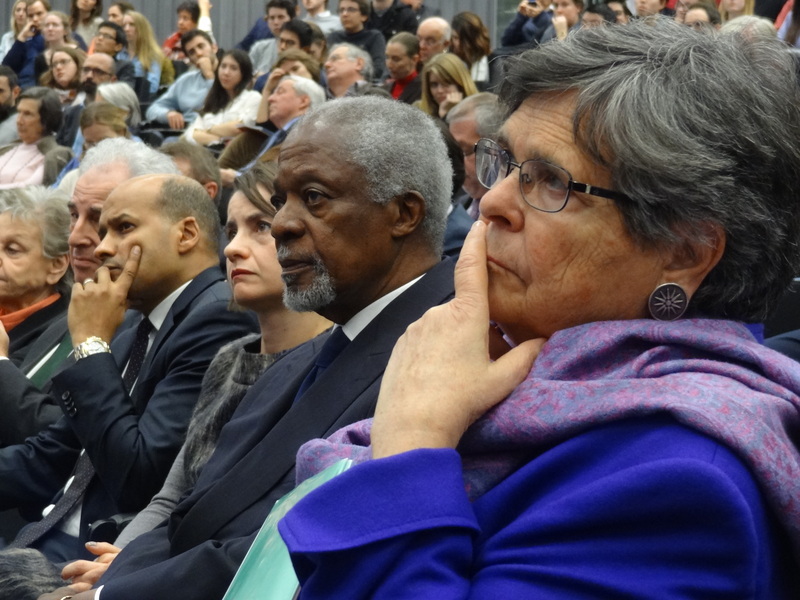 It is fitting that the Global Commission has now moved to Geneva under the chairmanship of Ruth Dreifuss. No city is more open in its outlook or puts a greater emphasis on the ideals of peace, tolerance, justice, and humanitarianism. From the “humanitarian capital of the world” the Global Commission can continue to strengthen the human rights and health-based approaches to drug policy. But regardless of the location – and I am especially pleased that some colleagues from Vienna are here today, including the Chair of the Commission on Narcotic Drugs – we must remember that we all work towards common goals. The preamble of the 1961 United Nations single convention on narcotic drugs states that the “health and welfare of mankind”, and I repeat “health and welfare of mankind”, is the main objective of that convention. Unfortunately, current drug policies in many countries will not lead to the achievement of that objective. To the contrary, those policies have resulted in what the United Nations Office on Drugs and Crime has called ‘unintended consequences’. Those unintended consequences include the creation of a huge, international criminal black market that fuels corruption and spreads violence. Misguided attempts in some countries to prevent the use of drugs by only punitive measures have not worked; instead they have resulted in mass incarceration. And some countries spent more on prisons than education. In other countries, the so called “war on drugs” has led to massive insecurity. As I have said before and I repeat here tonight: I believe that drugs have destroyed many lives, but wrong government policies have destroyed many more. A criminal record for a young person for a minor drug offence can be a far greater threat to his or her well-being than occasional drug use. In many parts of the world, drug users are stigmatized, live under constant threat of arrest and are prevented from seeking treatment and support. So I am convinced that current drug policies have to be reformed to ensure that they encourage prevention and treatment based on evidence of what works. Sadly, drug policy has never been an area where evidence and effectiveness of policies have led the way. Obviously, we all want to protect our families from the potential harms of drugs. But if they do develop a drug problem – that is a chronic relapsing illness as the WHO has defined it – they should be viewed as patients in need of treatment and not as criminals. In what other areas of public health do we criminalise patients in need of help? Surely it cannot be the job of the criminal justice system to prescribe remedies to deal with public health concerns. This is the job of public health professionals. And the UNODC Executive Director Yury Fedotov has said, “the conventions are not about waging a “war on drugs” but about protecting the “health and welfare of mankind”. We should focus on that objective. The current drug policies are not achieving that goal. So the key question is: what policies would enable governments and health authorities to counter and reduce the social and health harms that drug use can cause? If I may, I would like to make three suggestions. First, strengthen treatment services, especially in middle and low-income countries. Second, decriminalize drug use. Punitive measures do not work and put lots of people in prison where their drug use may actually get worse. Third, we need to learn how to live with drugs so they cause the least possible harm. Even though we would like a “drug-free world”, this is not a realistic ambition.Tobacco is a good example of how a dangerous and addictive product is being regulated because we know that it cannot simply be outlawed. As a result, the number of people who are addicted to cigarettes and tobacco has gone down in a large number of countries. And this happened without anyone being arrested or put in jail or sent to a “treatment program” by a prosecutor or a judge. It was achieved through higher taxes, restrictions on sale and use, and effective anti-smoking campaigns. It was regulation and education that led to this result. And the smokers in the room are probably working to turn this education into practice. We need to regulate drugs because they are risky. Drugs are infinitely more dangerous when produced and sold by criminals who do not worry about any safety measures. Legal regulation protects health. Consumers need to be aware of what they are taking and have clear information on health risks and how to minimize them. Governments need to be able to regulate vendors and outlets according to how much harm a drug can cause. The most risky drugs should never be available “over the counter” but only via medical prescription for people registered as dependent users, as is already happening here in Switzerland. Drug policies should be grounded in scientific evidence and a deep concern for health and human rights. That is why we strongly believe the time is right for a smarter, health-based approach to drug policy.